Upgrade Joomla! 3.0 is the first major CMS to be MOBILE READY! The reason you should aim to be mobile friendly is that you are losing customers right now because of the frustrating experience they have on their mobile device. 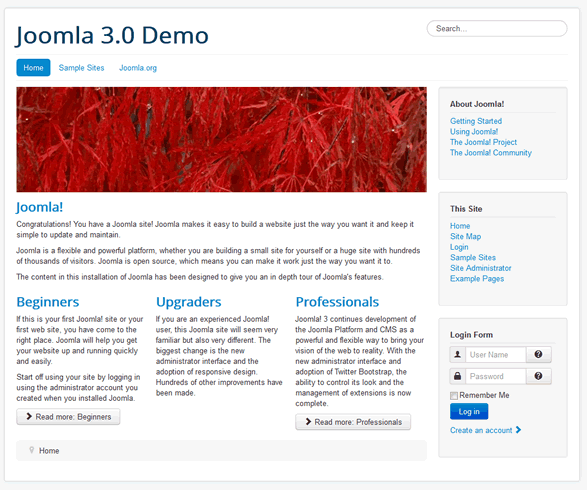 Joomla 3.0 is RESPONSIVE in both the front and back end. That is, the page layout responds or adapts according to the screen size that it is being viewed on. Joomla 1.5 must be updated to 1.5.26 before migrating to Joomla 3.0. Joomla 2.5 should be updated to 2.5.9. This is stable and reliable, and you can happily stay with it until 2014 (when support for it ends). The Upgrade Joomla 3.0 is easy through a one-click upgrade button in the back-end of Joomla 1.6, 1.7 and 2.5. You might find yourself prompted to do so but you must resist the temptation until you have checked its wise to do so. Does your current web server meet the requirements to run Joomla 3.0? Check Joomla 3.0 technical requirements. Is your existing site template compatible with upgrade Joomla 3.0? Check with template provider to see if they have a J3.0 compatible version. Are the third party extensions (components, modules and plugins) upgrade 3.0 compatible? ? Check with extension authors to see if they have a J3.0 compatible versions. If you upgrade without taking these issues into consideration, then expect something to go wrong or not work as you would expect. The good news is that many extension developers have already developed or are developing Joomla 3.0 compatible versions of their products. You can test the responsive ability of Joomla 3.0 on your smartphone or tablet by visiting the Joomla Demo Page. If you don’t have a mobile device handy, visit the Joomla 3.0 Demo on your desktop and just narrow the size of your browser window to see how the web page layout changes.